A hostel has usually had many incarnations. 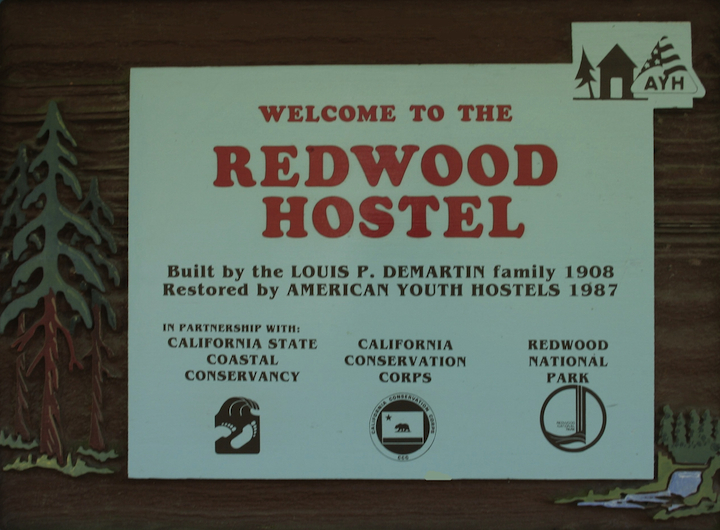 Redwood Hostel used to be the home of the De Martin family, who raised sheep and goats on this land more than one hundred years ago. Other hostels used to be mansions, lighthouses, military outposts, farmhouses and even castles. Fun fact: there are roughly 110 hostels in the United States and 4,000 hostels in 60 countries worldwide. We are members of the largest organization of hostels, Hostelling International. To be precise, we belong to the Golden Gate Council of Hostelling International-USA. From 4 – 10 p.m.
Not anymore! Beginning June 1, 2007, registered guests have 24-hour access to the hostel. In a shared or private room. We have four shared rooms: Hupa, Wiyot and Chalula (6 beds each) or Yurok (8 beds). There are two private rooms: Karuk has one queen bed, while Tolowa comes with a queen bed on the bottom and a single bunk bed on top, ideal for families with young children or up to three adults. We can also convert a shared room into a private room for your group, if you pay a small surcharge. In short, our kitchen has everything but the groceries. Stock up in Crescent City if you’re coming from the north (Safeway, Harvest Natural Foods, Ray’s Supermarket, Rainbow Grocery Outlet, Shop Smart) or in Klamath if you’re coming from the south (Klamath Market, Woodland Villa). Glad you asked. While we support local businesses and are glad to see hostellers buying jugs of milk at the Klamath Market, we also have some goodies available at Snack-quoia Sempervirens, our little store. movies and documentaries, but that’s about the extent of high technology in these parts. We do have a payphone and have phone cards for sale. If you have your own laptop, there are several places in Crescent City that have free Wi-Fi, including a coffee shop (The Coffee Corner), a diner (Glen’s), a deli (Chomperz), and breakfast/lunch restaurant (Good Harvest Cafe). If you don’t have your own computer, the Coffee Corner and the county library are your two choices for finding a computer or kiosk. Maybe you aren’t asking this question, but you’re probably thinking it. Yes, the hostel is immaculate! During our most recent inspection by Hostelling International, in February 2007, we scored 103.3% overall. We’re one of the highest-scoring hostels in the country. And as part of the hostelling experience, we gladly say “yes” whenever a hosteller asks if they can help out with a chore. Sure. We have a washer and dryer, and sell laundry soap at the office. Please limit laundering to the evening hours of 4-10 p.m. (so last load should be started by 8:30pm). The machines are located next to a sleeping room, and we don’t want anyone to have to fall asleep to the sounds of your jeans going through the spin cycle. We recycle plastic, glass, tin cans, aluminum cans, paper, cardboard, batteries, and food waste (we practice vermiculture, or worm-composting). The bins are located under the dining room side of the countertop and under the sinks. Please thoroughly rinse and flatten these items or they will mold, smell and attract bears when placed outside for pick-up. Did you just say you practice worm composting? Yep. Well, technically I didn’t say it, I wrote it. (Pardon us, the current managers were both English majors). It’s a great way to turn leftover food into high-quality soil that gardeners like to call “Black Gold.” To learn more about vermiculture, visit worms.com. We currently have 4 pounds of the little guys living in worm bins, which are kept inside a locked shed at the top of the hill, so as not to attract bears. Last Fall, one particularly pesky bear raided the hostel´s Dumpster a few times. He managed to perform a few belly flops on the lid, causing a complete cave-in. The kindly folks from the National Park Service ordered us a brand new, bear-proof Dumpster, and the bear retreated to the woods. If more ursine neighbors should happen to visit the hostel, we will make sure everyone is well aware and take precautions. Not anymore. The first official hostel, back in 1909, was begun by German schoolteachers looking for an inexpensive place for the kids to stay on backcountry trips. Hostels were geared towards young travellers in the early decades, but today we welcome everyone and there is no age limit. This is a common concern for parents. The hostel is ideal for families–it’s clean, quiet and safe. Just ask us. Our 21-month-old son likes to crawl up and down the stairs and “reorganize” the pots & pans cabinet every morning. And all the while, he’s surely safe. Three minutes. (And that’s walking–not driving). We’ll keep it in our Lost & Found for one month. Please call and we will send it to you, although we may ask you to cover shipping costs. After a month, we need to clear out the Lost & Found, and unclaimed items are donated to charity.